The story of Jack Wilson could be the story of so many players who have passed through professional baseball over the past century. Known for his determination as much as his fastball, Jack used both talents to forge a nine-year career in the major leagues. That’s not to say that Wilson was free of temptation to play those other sports. In fact, when he first reported to Columbia College for high school, he was immediately noticed by the football coach, who was determined to have Jack in the backfield. At the time, Jack was 180 pounds and would’ve been a welcome addition to any gridiron gang; for Wilson’s father, however, there would be no replacing baseball as his son’s greatest chance for athletic success. Jack, playing third base for the school baseball team in 1930, came to the attention of Oscar Vitt, the manager of the Pacific Coast League’s Hollywood Stars. Vitt brought Wilson to Hollywood for the summer of 1930, but upon arrival Jack found the hot corner occupied by former New York Yankee Mike Gazella. As a result, Wilson found himself released to the San Francisco Seals in August, where he wrapped up the fall of 1930 and began the spring of 1931. Unfortunately, Jack saw no playing time at third base in San Francisco because he was blocked by another big leaguer, ex-Cincinnati Red Babe Pinelli. [iv] Wilson was consequently farmed out to the Globe, Arizona Bears of the Arizona-Texas League, where he ended the 1931 campaign. On all of his first three professional teams Wilson hit .300 or better as an infielder, but because of the former major leaguers manning third base in the PCL, Jack was unable to break through. In the spring of 1932, when Wilson was informed he would have to go back to Globe, he decided to return home to Portland, free from any commitments to professional baseball. His return to Oregon set in motion the events leading to his call-up to the majors as a starting pitcher. “In my first appearance on the mound in the Coast loop, I faced Seattle. Some Seattle players had known me as an infielder, so they began to give me a going-over. ‘Look who’s trying to pitch!’ they yelled. ‘We’ll chase you clear back to Globe, Arizona.’ I don’t wonder that they thought I was easy pickings, for I was throwing like an infielder, without any follow-through, and I had little except a fastball. In throwing a complete game against the Rainiers, Wilson picked up not only a win, but also a 1933 contract with Portland. In his first full year with the Beavers, Jack was used primarily in relief, but in 1934 he was given the hill regularly as a starter, racking up a record of 9-9, with an impressive 13 complete games. Thanks to his showing with Portland, Wilson and fellow starter George Caster were both asked to report to Connie Mack’s Philadelphia Athletics in September 1934. Their contracts had been purchased from Portland on the recommendation of Mack’s son Roy, who at that time was the secretary of the Portland club. Both pitchers met up with the Philadelphia club in Cleveland, where Connie Mack tabbed Jack to start the first game of a doubleheader on September 9. In another stroke of unfortunate luck, A’s catcher Charley Berry, who had been prepping Wilson for his first big-league appearance, broke his leg just before the game, forcing Jack to throw to 19-year-old backstop Frank Hayes, himself in the middle of his first full year in the majors. Wilson was opposed by Cleveland right-hander Oral Hildebrand, who pitched a much better game. Wilson was tagged for eight runs and 12 hits and took the loss. On top of losing the game, Wilson also suffered a sore arm. When the season closed, Connie Mack sent Jack back down to Portland, deciding to hold on to Caster instead. “Well, I got to quizzing him about the Coast league. Who’s got the best arm in the league, I asked him. Having been acquired by the Red Sox, Jack used the offseason to give his arm a rest in an attempt to recover from the sore arm acquired in Philadelphia. When spring arrived in 1935, he went to camp with a healthy arm, a healthy outlook, and - most importantly - healthy job prospects as a reliever for the Boston Red Sox. Cronin wanted the rookie to get a bit more experience in professional ball and so Wilson was farmed out to Syracuse in the International League for six weeks before being called up to the Red Sox. As Wilson himself was quick to admit, he had little more than a fastball and his rugged physique at his disposal on the mound. In Syracuse, Jack benefited from working with Al Schacht and Tom Daly, coaches who gave him time to work on his curveball mechanics. [ix] After notching a record of 4-2, Wilson was called back to the majors. Jack’s first major-league win came on September 2, 1935. The Red Sox were playing host to the Washington Senators. Sox starter Wes Ferrell dug the Sox an early hole, giving up seven runs in just two innings before Cronin sent Wilson in to relieve in the third. Jack managed to hold the Washington hitters to just one run over the next six innings while the Sox sluggers mounted a comeback and tied the score at 8-8. Jack pitched the game through the top of the 11th, but when Boston failed to score the winning run it became Jack’s turn to seal the deal. In the bottom half of the inning. Jack stepped in against reliever Phil Hensiek. With the bases empty, the former infielder stood quietly as the count ran full. On the sixth pitch, Jack stepped into one, and hit what the next day’s Washington Post called a “screaming home run into the right-centerfield bleachers” for the game-winner. It was his first win, his first hit, and his first home run in the major leagues. Sportswriter John Drohan of the Boston American sat down with Wilson after the game and discovered that the rookie attributed his storybook ending to an unlikely source. “Somehow or other when I was up at the plate I thought of that. It’s funny how those things will run through your mind at times. Anyway, you recall how that young Washington pitcher pitched three balls without a strike. Naturally, [coach] Al Schacht gave me the ‘take’ sign, which means take the pitch regardless of where it is. The rest of the 1935 season saw Wilson notch two more wins and secure a place for himself on the Sox pitching staff. He posted a record of 3-4, with a 4.22 earned run average, but walked nearly twice as many (36) as he struck out (19). In 1936, Jack doubled both his wins and his losses, going 6-8 to accompany a 4.42 ERA as he struggled to clear the biggest hurdle for all young pitchers: his control. Former Yankees star Herb Pennock, who came to work as a coach for the Sox that year, worked extensively with Jack on his follow-through in an attempt to improve the young hurler’s accuracy. In particular, Jack credited Pennock with the development of a serviceable curveball. Despite that particular incident, the work from 1936 paid off the following season. The 1937 campaign began a four-year stretch of double-digit wins during which Wilson racked up more appearances and more wins (54) than any other pitcher on the Red Sox including the notable Lefty Grove, who won 53. No other pitcher on the Sox staff during that period won more than 32. Jack was willing and able to step up for any game that needed his help, and after a successful 1937 campaign he hoped to repeat in 1938. Unfortunately, his good fortune did not continue. On the way back north from spring training in ’38, he pulled a muscle in his leg. The injury hindered his efforts at the beginning of the season, though he still managed to pitch two shutouts in the first few weeks of the season, including a 5-0 win over Bob Feller and the Cleveland Indians on May 8. Wilson struck out 12 and induced many popups and flyballs. The Red Sox tied a record for fewest assists in a game – and the only assist came in the ninth inning. While he was able to pitch through the nagging injury to his leg, Wilson’s celebrated grit and determination came up against a more familiar challenge, the return of his sore arm. The pain in his elbow was so severe that Wilson was reportedly prepared to end his career. Cronin and the Sox sent the young hurler to see Dr. Robert F. Hyland, the surgeon for both the St. Louis Browns and St. Louis Cardinals, who found no serious injury. The prescribed regimen for Jack was a healthy dose of rest for his arm but he received little, returning to his regular turn in the rotation before long. During the next three seasons, from 1939 to 1941, Wilson posted only one more winning record, going 12-6 in 1940, while his total innings pitched declined steadily. In each year from 1937 through 1940, his earned run average climbed. One of the few milestones of these three seasons was as a batter - he took White Sox pitchers deep twice in a game on June 16, 1940. He hit the first into Comiskey Park’s upper deck off Jack Knott; the second came off Pete Appleton. The two home runs were the last of Wilson’s professional career, but they made him one of only 23 American League pitchers to homer twice in the same game. At the close of the 1941 season, during which Jack recorded only four wins against his 13 losses, the Red Sox began looking for ways to trade the now-ineffective pitcher. That was a sad year when I was traded to Washington. That Cronin – I saw him in San Francisco after the ’41 season. I played golf with him and Ty Cobb and Tony Lazzeri. I went down to see him on purpose ‘cause I knew the newspapers were on me pretty bad. My arm wasn’t so good and I knew they were trying to trade me. The trade was made on December 13, 1941. Wilson and outfielder Stan Spence were sent to the Senators for pitcher Ken Chase and outfielder Johnny Welaj. Jack pitched 42 innings for the Senators in 1942 and surrendered 57 hits to opposing batters, a sign of his ineffectiveness. He was 1-4 with a 6.64 ERA. Nevertheless, the Senators were able to sell his contract to Detroit on July 17. He threw only 13 innings for the Tigers; they were the last innings of his major league career. Wilson was exempted from military service when bone chips were found in his arthritic elbow during his examination. The surgery to remove the chips guaranteed that he would see no action. Unable to serve in the military, Jack returned to Portland. There he found work at Willamette Iron and Steel building ships for the Navy. Jack ended up making his shipyard job part time, as he signed on with the Beavers to pitch once more. Jack threw three more seasons in the Pacific Coast League, two for Portland and one for Sacramento, but the success he had in 1937 continued to elude him. Wilson finished his professional playing career after appearing in just four games for the Sacramento Solons in 1945 and giving up 8 earned runs in 14 innings. His major league career totals were 68-72 with a 4.59 ERA. He walked 601 and struck out 590 in 1131⅔ innings of work. As a batter, he hit .199. After finishing his playing career with Sacramento, he returned to Columbia College, which had become the University of Portland in 1935, to coach its baseball team for the 1945 and ’46 seasons. Jack was a coach with the Salem Senators in the Western International League in 1947 and ’48. Unfortunately, like many former Sox players, Jack was never able to find a place in the Red Sox system. Wilson’s feelings towards former manager Joe Cronin kept him on the outside looking in. JW: I liked to start. I’d start and go nine innings, but Cronin ruined my career. I’d hurt my arm pitching today and tomorrow and the next day and then starting. It was nothing to pitch nine innings today and go down in the bullpen and go in and save one the next day, but they didn’t count saves in those days. BK: Elden Auker said the worst year he ever had was the year he played under Cronin. He was not thrilled with him as a handler of pitchers. Wilson’s strong feelings regarding what he perceived as Cronin’s hand in the shortening of his career came back to haunt him. A confrontation with Cronin in 1942, when Jack was with the Senators, forever soured their friendship. Cronin never forgot Jack’s bitterness, and when Joe was promoted to the general manager position in 1948, he prevented Jack from finding a spot in the Red Sox system. “[T]hat was the end of everything,” recalled Jack. “Ed Doherty was in public relations, then he went in the service and then they gave him a ballclub – Scranton – to run and he asked me if I’d manage it and I said, ‘Yeah.’ He called me and told me I had the job and then he wrote me a letter and told me that Cronin, who was then the general manager of the Red Sox, said that I wasn’t gonna manage the ballclub and that was it. After the 1948 season, Wilson left the Salem team to pursue work in the pinball machine and jukebox industry. In 1949 Jack and his aunt bought a tavern in Forest Grove, Oregon. They sold it three years later, when Wilson went to work for the Lucky Lager Brewing Company as a salesman in Portland, Salem, and Spokane. Jack left his salesman position to work for the Lucky Lager distributor in Spokane, where he and his family settled down. In 1964, he moved to San Rafael, California, to run his own Lucky Lager distributorship, though he sold it five years later, returning to Portland and eventually Spokane, where he resumed his job at the Lucky Lager distributor. He remained in that position until his retirement in 1977. The Wilsons moved to Lynnwood, Washington, to be closer to their daughters and three grandchildren. Although Jack had been out of professional baseball since 1948, he left a legacy in the national pastime that was carried on by his grandsons Joe and Andy. Both boys played high school and college ball, with Andy playing shortstop for the University of Utah; they also taught and coached baseball at Edmonds-Woodway High School in Edmonds, Washington. Andy coached the JV team for eight years, and his older brother Joe coached the varsity team to 200 wins over the course of a 15-year tenure. [xv] As a fitting denouement to his professional baseball career, Jack was inducted into the Oregon Sports Hall of Fame in 1994. John Francis “Jack” Wilson died of a stroke on April 19, 1995, in Edmonds, Washington. He was 83 years old. 1938 Boston Red Sox regular season game log, http://www.retrosheet.org/ (accessed April 28, 2008). “Cards Win 2; Nats Split Pair with Red Sox.” Washington Post, September 3, 1935. ProQuest Historical Newspapers for the Washington Post (accessed June 17, 2008). “Descendants of James Walsh, Generation No. 4.” http://familytreemaker.genealogy.com/users/w/e/b/Bruce-J-Webster-Jr/GENE5-0006.html, (accessed May 3, 2008). Drohan, John. “Home Run Hero Was Confident of Ability.” September 4 1935. Jack Wilson player file, National Baseball Hall of Fame and Museum. Drohan, John. “Joe Cronin Enthuses As Wilson Wins Ninth.” July 17 1937. Jack Wilson player file, National Baseball Hall of Fame and Museum. Edwards, Henry P. Press Release from American League Service Bureau to Sunday Papers, Jack Wilson player file, National Baseball Hall of Fame and Museum. Felker, Carl T. “Jack Wilson, Flop as Third Sacker in Minors, Gets to Majors by Turning Hurler Over Dad’s Protest.” February 20 1941. Jack Wilson player file, National Baseball Hall of Fame and Museum. Howe Bureau Player Card for John Francis Wilson. n. d. Personal email from Rod Nelson, January 16, 2008. “Jack Wilson.” Baseball-Reference. http://www.baseball-reference.com/w/wilsoja01.shtml, (accessed September 20, 2007). “John Francis Wilson.” Seattle Times, April 20, 1995. Kathie Webster, personal email, May 27, 2008. Kelley, Brent. In the Shadow of the Babe: Interviews with Baseball Players Who Played With or Against Babe Ruth. Jefferson NC: McFarland & Company, 2001. Kelley, Brent. “Jack Wilson: Former Red Sox hurling ace speaks out.” February 14 1992 Jack Wilson player file, National Baseball Hall of Fame and Museum. Povich, Shirley. “Nats trample Sox, 9-3; Sure of 4th.” Washington Post, September 26 1936. ProQuest Historical Newspapers for the Washington Post (accessed May 7 2008). Spink, J.G. Taylor. 1942 Baseball Register. New York: The Sporting News, 1942. Stout, Vic. “Lefty Grove, Poffenberger Pitch Today.” August 28 1937. Jack Wilson player file, National Baseball Hall of Fame and Museum. Untitled Summary of Jack Wilson Call-up to Philadelphia. September 14 1934. Jack Wilson player file, National Baseball Hall of Fame and Museum. Whitman, Burt. “Jack Wilson, Who Started as Infielder, Looms as Red Sox Ace Relief Pitcher.” March 8 1935. Jack Wilson player file, National Baseball Hall of Fame and Museum. [i] “Descendants of James Walsh, Generation No. 4,” http://familytreemaker.genealogy.com/users/w/e/b/Bruce-J-Webster-Jr/GENE5-0006.html (accessed May 3, 2008). 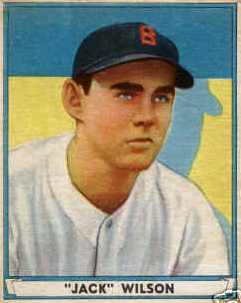 [ii] Carl T. Felker, “Jack Wilson, Flop as Third Sacker in Minors, Gets to Majors by Turning Hurler Over Dad’s Protest,” February 20 1941. Jack Wilson player file, National Baseball Hall of Fame and Museum. [iv] Henry P. Edwards, Press Release from American League Service Bureau to Sunday Papers, Jack Wilson Hall of Fame player file. [vii] John Drohan, “Joe Cronin Enthuses As Wilson Wins Ninth,” July 17 1937. Jack Wilson Hall of Fame player file. [viii] Burt Whitman, “Jack Wilson, Who Started as Infielder, Looms as Red Sox Ace Relief Pitcher,” March 8 1935. Jack Wilson Hall of Fame player file. [ix] John Drohan, “Syracuse Star Is Expected to Join Regulars,” July 15 1935. Jack Wilson Player File. [x] John Drohan, “Home Run Hero Was Confident of Ability,” September 4 1935. Jack Wilson Hall of Fame player file. [xi] Vic Stout, “Lefty Grove, Poffenberger Pitch Today,” August 28 1937. Jack Wilson Hall of Fame player file. [xii] Brent Kelley, In the Shadow of the Babe: Interviews with Baseball Players Who Played With or Against Babe Ruth, (Jefferson NC: McFarland & Company, 2001), p. 162.